This was posted by our front door on the white board. 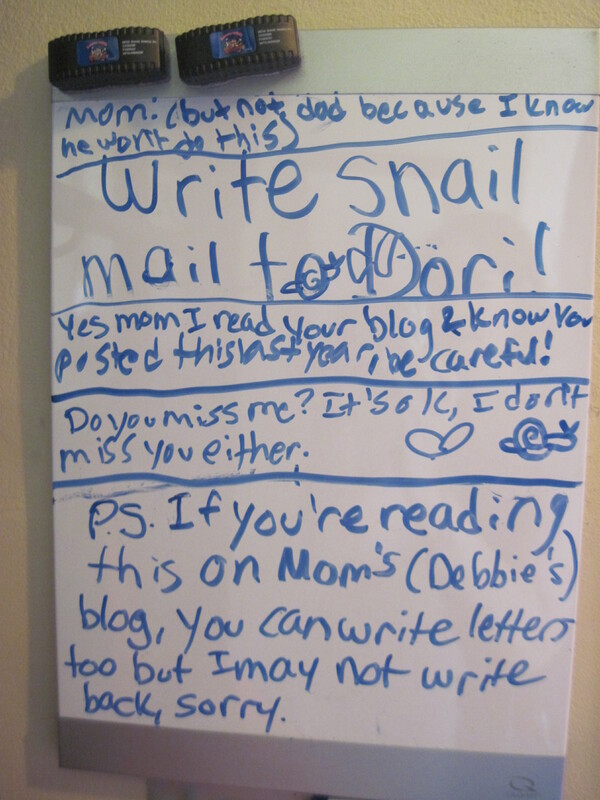 Just in case you can’t read this very well on your device or computer, it says,”Mom (but not Dad because I know he won’t do this), write snail mail to Dori! Yes Mom I read your blog and know you posted this last year – be careful! Do you miss me? It’s okay I don’t miss you either. P.S. If you’re reading this on Mom (Debbie’s) blog, you can write letters too, but I may not write back, sorry. So if you want to write Dori letters and not get one in return, let me know and I’ll send you her address. I’ll write a snail mail letter! Just for kicks!